It’s been a while and stuff’s been going on, so time to check in on the state of civ-mil. It’s not going very well for the civilians. But well into this new era of cohabitation — the boys won’t take over, they won’t let the civilians rule either — it’s hard to know if what’s playing out at any given moment is a redefining of the rules further in favour of the boys or just the bumbling of the civilians. Take this business down in Karachi. Back in September 2013, when the operation was launched, there seemed to be a genuine civilian component. Nawaz owned it, Nisar prattled on about it and the IB showed off. What about Nawaz? The man seems lost. And the longer it goes on, the more lost he seems. No one really thought Karachi was going to be a civilian-run affair, but the civilians were in the game, playing it and shaping it to some extent. Now, 18 months on, the N-League is wandering around outside the stadium, lost and pitiful. Even when they do react or try to participate, it just exposes the N-League’s irrelevance. Smarter players would have known that Altaf’s harangue this week would elicit a fierce response from the army. Smarter players would have known a quick decision was needed: either stay out of it altogether or get in before the boys said something first. The worst-case scenario was leaping into the fray after the boys had thundered back — because everyone would know a belated response was a forced response, done at the boys’ behest. And that’s exactly what the N-League has done: chosen the worst option — attacking Altaf after the boys had thundered at him, leaving the world to behold the pitiful sight of a government that takes on fellow civilians at the flick of a wrist by the boys. Silence is sometimes better. And alacrity even better. The N-League seems unaware of both. But let’s look at the bigger picture. Cohabitation may be the new game in town, but to what end? What are Raheel and Nawaz really up to? With the chief, halfway into his three-year term, a trend is apparent. He’s unafraid of the big decisions, but has to play for space internally. There’s four things we can see: he’s gone all-in on the fight against militancy internally; he showed some inclination to reach out to Afghanistan; he’s been a hawk on India and Balochistan. In that, you can sense a balancing act: to get his primary goal done, he’s sacrificed secondary interests. For in Raheel’s all-out push against militancy internally, there were likely some reservations among the boys. Not out of any sympathy for Fazlullah — it’s almost an article of faith to hate Fazlullah and co now — but because of the stretch it has caused. Operating at this level with this fierceness for this long in this many places — NWA, Tirah, the CT stuff in the cities — is about as all-out as you can go. There is also the network effect: to take on the TTP so totally risks brushing up against the other strands of militancy that are still deemed valuable. Then there’s Afghanistan: a shift in language engineered by the chief surely alarming some internally. Even if you need Kabul to help out with stuff linked to the fight against militancy internally, seeming so comfortable with Kabul when the real allies of Pak there are down in the south has surely not gone unnoticed. And ever since the balancing act has emerged. And ever since the hawkishness on India and Balochistan has gone up several notches. To get the primary goal done, secondary interests have been sacrificed. Cohabitation wasn’t his idea. He surely hates it. But the most striking thing is how unprepared he was for it. Cohabitation isn’t new, it came into being under Zardari: they’d let him go on, if he let them manage the core interests. Zardari was game, since getting to the finish line was achievement enough. Maybe Nawaz didn’t think it would apply to him. Maybe Nawaz thought that Zardari succumbed because he was neither interested in anything more nor had the will to fight it. But cohabitation has applied to Nawaz and he seems less capable of dealing with it than Zardari. Part of it is ego: Zardari usually looks like he knows he hit the jackpot; Nawaz projects a sense of entitlement, that ruling is what he was born to do. Part of it is that the pressure on Nawaz has been more intense: to browbeat a dodgy politician from Sindh you need less than what you need to beat into submission a popular politician from Punjab. But the combination has been deadly, leaving Nawaz more listless than ever — and the boys more confident than ever. Even the brief surge in intensity and interest during the Yemen crisis is already gone. Nawaz not only doesn’t have a plan to deal with cohabitation, he looks like he doesn’t have a plan. He looks a beaten man. 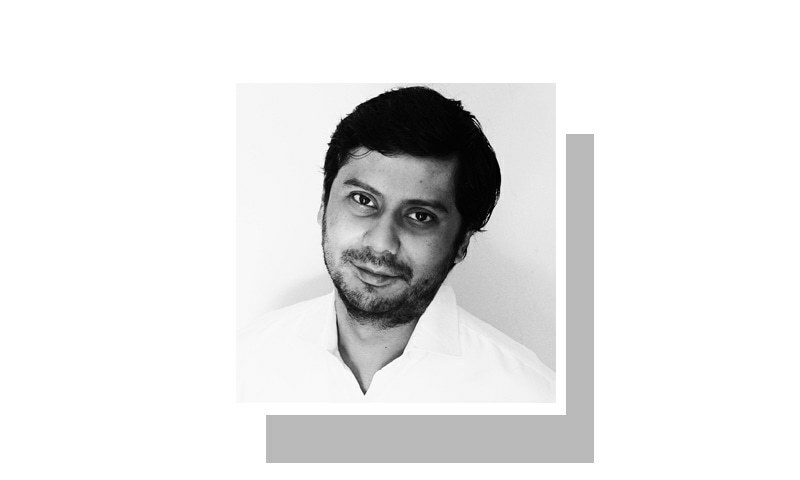 Zarb-i-Azb, dharna and Musharraf — those are the markers of how cohabitation was enforced and those are markers of what have left Nawaz a man with few ideas and little spirit. Want to know how bad it really is? Musharraf was the one thing that Nawaz had left, a course he could shape and clearly wanted to shape. Now, it’s been reduced to this: Musharraf can leave, if he signs a deal like the one he once forced Nawaz to sign. But Musharraf isn’t biting. He knows a beaten man when he sees one. A succinct summary of NS's predicament. For good future and prosperity of pakistan, so that she is in peace with herself and her neighbors, Nawaz must wear out Musharraf and prevail, so that the civil military equation is reset to where the military is subservient to the govt and not interfering in its running. great as ever, well-said. each word of it. An accurate analysis of the current situation. Cohabitation? You may call it, but for me it is more like reverse pulling- NS is more like Qurbani ka Bakra being pulled by his forced owner against his will. The only way to have strong grip in affairs is Turky's model. Show performance where one can, the rest will come ultimately. Why is so that Presidents come and go, but security Policy of USA remains the same, Please think over it. Surely you will get the answer. Cyril the biggest freedom that Zardari has is he doesn't owe it to Saudis whereas nawaz has to make sure that the orders from the kingdom are complied with. he would think he is better placed than zardari because he has Arabs backing but that's the biggest advantage Nawaz has. secondly zardari is least bothered about maintaining relations of any sort with India and that is what the BOYS want. nawaz doesn't seem to get any of it. commingled with all this is the laid back attitude. so he seems to be losing it on all and every front miserably. Rather than pursue the failed course and goals, I think NS has lowered his aims: secure another term through delivering on their promises. Interestingly, that is actually a higher aim if he can realize. You let Zardari off the hook because, during his tenure, "getting to the finish line was achievement enough." . What would be "achievement enough" at the end of Nawaz's time? I suggest three things: (1) beating back terrorism in Pakistan, (2) producing enough energy to permit the economy to grow, and (3) getting to the finish line with a stronger democratic consensus. . As long as progress continues on these three things, he is unbeaten and on top of his game, and his successor will be stronger than he is. Cyril ! You are good. @shyam Your suggested arrangement will only be acceptable once doors to power are closed to crooks.